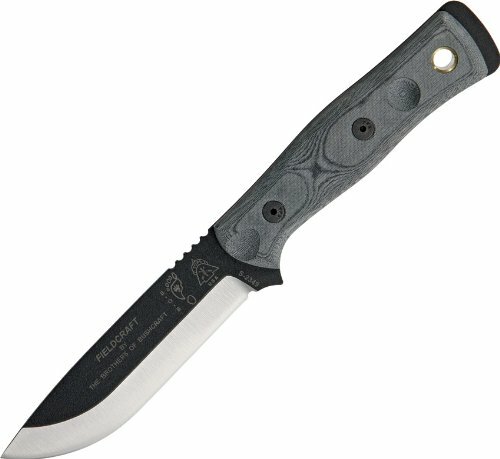 The Fieldcraft Knife was designed by The Brothers of Bushcraft, a coalition of men across North America focusing on sharing wilderness living skills of all categories. From tracking, to building shelters, the Brothers of Bushcraft make it a point to show the skills to all people, of all ages, from all over. The Fieldcraft Knife is the culmination of their knowledge, combining experiences from; the broad and humid rain forests, the arid and scorpion-littered deserts, and the frigid northern lands that span the Americas. The handle is one of the most ergonomic ones on the market, sporting several useful additions. Although knives with a lot of frills often end up lacking, the additional items found on the Fieldcraft knife were selected from experience and critiqued in every step of design, development and production. Being made of canvas micarta, the handle will never let you down. The bow drill divot on the handle is frictionless and makes starting those primitive fires almost effortless. The "Thumb Scallops", formed on the hilt of the handle offer more comfort and control when using specialized carving and skinning grips. The pommel of the blade is simply the tang of the knife exposed enough to allow impact from a baton to not effect the handle (though the micarta is definitely tough enough to take such abuse). On the exposed pommel, you will find a scraper specially designed by one of The Brothers of Bushcraft, for striking Ferro rods in a safe and efficient manner. The Fieldcraft knife has had heavy duty abuse, and testing done in the wilderness of Canada, where local survival experts Mors Kochanski, Dr. Gino Ferri, and many others have deemed her a "Serviceable Field Knife". These words are exactly what she is meant to be. The TOPS Knives/Brothers of Bushcraft Fieldcraft Knife will do just about any chore that you can throw at her in a wilderness survival scenario.